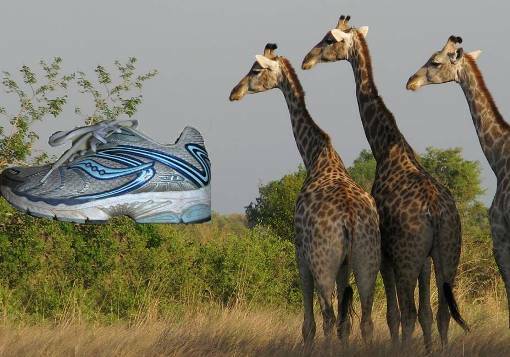 It may be due to running form – how and where our feet land on each step – which in many runners may reflect the wearing of heavily-cushioned running shoes, which permit a longer stride and subsequent landing on one’s heel, then the rest of the foot. Buh-boom. The renewed interest in running form has led to a debate about the pros and cons of cushioned and motion controlling running shoes and their affect on the runner’s stride. You can check several of the links on this page or Google “debate on running shoes”. The recent popularity of barefoot running stems from the gait typically used by people who run barefoot, including children, some indigenous groups, several East African marathon champions, and basically everybody who ran before the 1970s. Studies of gait patterns suggest that a landing on the midfoot or forefoot, as one tends to when barefoot, is softer and more efficient than a landing on the heel. Runners who land on their midfoot don't brake their body weight as they hit the ground, conserving energy and slowing the rate at which impact forces travel up the leg. So what is good running form? Run “tall”, meaning stretching yourself up to your full height with your back and torso comfortably straight (no slouching). Some coaches recommend a slight forward lean without hunching your shoulders or bending at the waist. Keep your ankle flexed as your foot rolls forward to create more force for push-off. These points on running form are echoed in a 2010 article in Running Times. from Jacky Ledeboer showing Kenyan marathoner Moses Mosop at work and how his stride differs from your average runner. The form debate, mainly over midfoot vs heel striking, stems from a lack of conclusive evidence that runners with good form are healthier or run faster, according to Peter Vigneron, in this Runners World article. Preventing injury is where the allure of proper form may be greatest, yet studies with control groups are still needed to compare injury rates or efficiency among midfoot-strikers and heel-strikers (or shod vs barefoot runners). Evidence of the effectiveness of midfoot striking running to date is still mostly anecdotal —in other words, nobody is 100% sure whether good form does, in fact, avoid injury, and changing one’s body mechanics takes time and has its own issues. Nevertheless, there is evidence that midfoot/forefoot striking may result in fewer injuries. The evidence may also extend to midfoot/forefoot striking motion while walking. 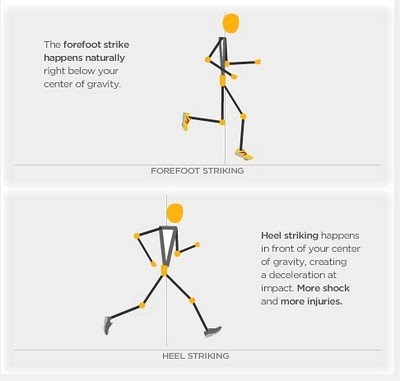 So the advice for heel-strikers currently stands that if you suffer from chronic pain in your lower legs (i.e. shins and knees) or heels, you should consider reviewing and possibly changing your running form, whereas if you are an experienced runner without such problems, you might be best to stick with what works. Try running in place in bare feet, which will naturally encourage you to avoid landing on your heel. Here are some specific instructions from Coach Roy Benson in the Running Times article to "...practice running fast while landing over your center of gravity”. “Often best done by going to a field or other safe, soft surface and shedding your shoes. At first, jog in place. You'll be landing on the ball of your foot. That's what it feels like to be a midfoot striker. Now stay up there and jog in place and lean over and slowly accelerate over the next 50 yards or so and don't go so fast that you forget to stay up there and land on the ball of your foot. When you do them right, strides like these are fast enough to be a good way to teach midfoot strike." Then of course you need to stay conscious of what that foot strike feels like during your normal workouts! Out of desperation from 3 months of fairly consistent pain from plantar fasciatis, I restarted running one day earlier this year by (sheer accident) doing something similar. Me: "What if I just run in place?" (tries running in place). Me: "OK, great! What if I go forward just slightly?" (tries running in place with very slight forward movement). Me: "OK, that didn't hurt it either." Bolstered by all this communication with myself, I jogged SUPER slowly that morning, taking short strides, landing on my midfoot, and going back to running in place to reinforce the landing. Happily, I've gradually returned to running regularly, always (literally every step) conscious of my foot strike location, stride length and cadence, and general form. It is possible! Perhaps some of you have similar stories?